Today I’m sharing yalanji, or Syrian vegetarian stuffed grape leaves. Yalanji is actually a Turkish word meaning “fake,” distinguishing it from the meat-filled wrapped grape leaves. There’s no other dish that shows as much love as stuffed grape leaves. Labor intensive and precise, this one is truly a blessing of the hands. When it’s done right, I prefer this version to any other version of stuffed grape leaves. The filling is comprised of caramelized onions, rice, lots of fresh mint and delicious Turkish pepper paste. The ingredient that makes it really special? Pomegranate molasses: tart and sweet, adding so much dynamic flavor. You want your filling to be rich with olive oil. Don’t be scared of it! Don’t add too much filling. Remember the rice expands when it’s cooking. You should be able to wrap the leaves tightly at least twice around. Of course, if you have any further questions, reach out! I’d love to help you. I really hope you love the recipe. If you give it a try, don’t forget to put it in the comments and tag #omayahcooks and @omayahatassi on Instagram. 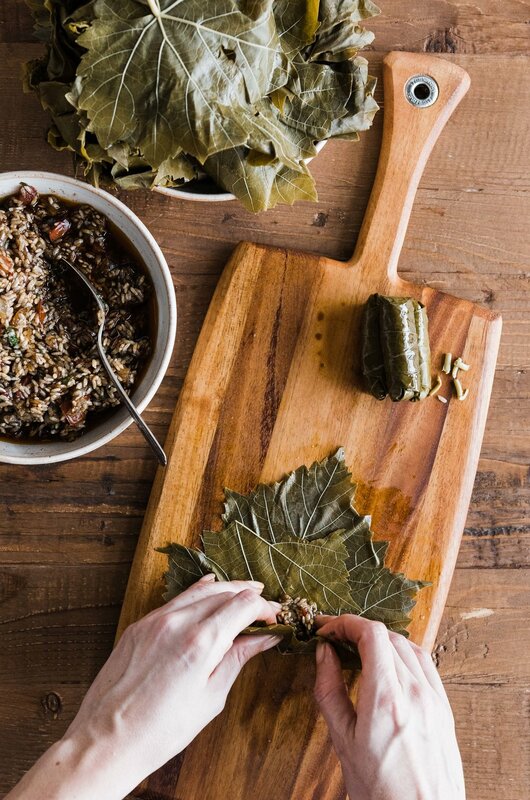 Grape leaves stuffed with rice, tart pomegranate molasses, fresh mint and other spices are a true labor of love. If using jarred grape leaves, drain and soak in hot water for about 3 hours, changing every hour. If using fresh, wash and lay flat to dry. Add the onions and olive oil to a 12 inch skillet and cook over medium heat until soft and beginning to caramelize. Remove from heat and add all remaining ingredients except for the potatoes. Taste the filling by placing it on the tip of your tongue. It should feel somewhat salty and acidic. If it needs more acid, add pomegranate molasses, and adjust salt. When the grape leaves are ready, drain. Lay a grape leaf on your work surface and remove the stem if it has one. Cover up any openings by ripping another grape leaf and laying it on top where needed. Place about 1 Tbsp of filling (more or less, depending on the size of the leaf) near the bottom third of the leaf. Roll the bottom of the leaf up over the filling tightly. Fold the sides in and continue rolling tightly. Set aside seam-side down and continue with remaining grape leaves, reserving about 5-10 to line the bottom of the pot. When you've finished wrapping the leaves, line the bottom of a large pot with the sliced potatoes. Cover with remaining grape leaves to block the starch from the potatoes. Place the rolled grape leaves in the pot tightly. Cover the rolled grape leaves with a heat-proof plate or ceramic weight. Top with enough water to fully submerge the wrapped leaves, about 5 c. Add another teaspoon of salt and set over high heat to bring to a boil. Reduce to a simmer, cover and cook for 2.5 hours, being sure to check periodically on the cooking liquid and adding more water if necessary. After 2.5 hours, remove from heat and add 1/2 c lemon juice and another 1/4 olive oil. Once cool enough to handle, remove the weight or heat-proof plate. Cover the pot and all the grape leaves to completely cool in its cooking liquid for several hours, preferably overnight. After the grape leaves are cool, remove from cooking liquid and transfer to an air-tight container. Can be made up to 4 days ahead.